Although I cruise more than 15 times a year, it is unusual that I took 3 cruises in Europe within the span of 30 days! The reason? I suddenly had some spare time and it is better -valued and trouble-free cruising than travelling on land. 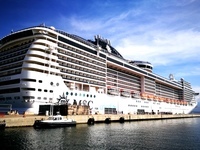 The first was a Mediterranean cruise on MSC Fantasia, from Genoa, on 16 September. I did not pay the cheapest but was glad to find a Yacht Club cabin at a good last-minute bargain price. MSC’s Yacht Club, on which I made quite a few trips, is one of my favourites, as it offers first class service at a reasonable price. This cruise does not disappoint. From check-in in Genoa to disembarking with my good butler taking me to a taxi, and impeccable service all the time during sailing days, I was all VIP (that I am actually not, I am afraid). Have done various MSC ship many times (Gold member). Membership does not give more useful benefits such as free internet on Cunard and Princess at similar level, but ticket price is discounted as well as some onboard service. 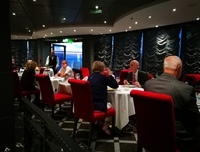 The food is good at the special YC restaurant, and service is first class like on luxury ships. Yacht Club cabins are not much larger, but it is the food and other services, such as special YC deck area on ship and lounge, inclusive wine, and most important the good butler service, that count to make YC an even better valued proposal than an ordinary cabin for me. The itinerary is well-travelled, only one port, Ajaccio, was my first call. Genoa is an excellent starting port, easy embarkation, and much to see, so I had a pre-cruise stay of 3 nights before sailing. Cannes was next and we had a long whole day to explore the city. Palma de Mallorca came next, then Barcelona, both I had too many visits and so it was relaxing for me. The ship is my destination, that’s why I booked Yacht Club. Often a little stroll on familiar streets, then home for a fine dinner. MSC offers good entertainment with production-type shows every night. Then Ajaccio, my first visit although I have called on Bonafacio and Calvi on previous cruises. It was still too much sun and too hot on Sept 20 to have an otherwise most pleasant stroll of this town. For me ports like this of compact size are most desirable for cruise ships. Then Civitavecchia, and I didn’t bother to add one more of many revisits to Rome. Civitavecchia has become a permanent bore to frequent cruisers like me who do not bother to take 3 hours in train travel to Rome. Last call was La Spezia. An excursion port to see Firenze, Pisa, or Cinque Terre. It was bad that as I landed late I miss the few transportation to the latter, which I have visited of course but want to see again one of the most picturesque places of the world. It was an all-port day busy itinerary, great for first time cruisers of the Med. MSC has many ships doing similar itinerary. The spectacular new vessel Seaview was next to us in Genoa for departure same time but I have chosen Fantasia for Ajaccio to have at least one port of touristic interest to me. Paying a good last minute fare for Yacht Club, it was always a good idea if you have time to spare And alas, I still had time, so I embarked Costa Fascinosa the day I disembarked.. Although I cruise more than 15 times a year, it is unusual that I took 3 cruises in Europe within the span of 30 days! The reason? I suddenly had some spare time and it is better -valued and trouble-free cruising than travelling on land. 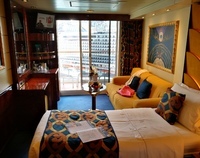 The first was a Mediterranean cruise on MSC Fantasia, from Genoa, on 16 September. I did not pay the cheapest but was glad to find a Yacht Club cabin at a good last-minute bargain price. MSC’s Yacht Club, on which I made quite a few trips, is one of my favourites, as it offers first class service at a reasonable price. This cruise does not disappoint. From check-in in Genoa to disembarking with my good butler taking me to a taxi, and impeccable service all the time during sailing days, I was all VIP (that I am actually not, I am afraid). Have done various MSC ship many times (Gold member). Membership does not give more useful benefits such as free internet on Cunard and Princess at similar level, but ticket price is discounted as well as some onboard service. The food is good at the special YC restaurant, and service is first class like on luxury ships. Yacht Club cabins are not much larger, but it is the food and other services, such as special YC deck area on ship and lounge, inclusive wine, and most important the good butler service, that count to make YC an even better valued proposal than an ordinary cabin for me. The itinerary is well-travelled, only one port, Ajaccio, was my first call. Genoa is an excellent starting port, easy embarkation, and much to see, so I had a pre-cruise stay of 3 nights before sailing. Cannes was next and we had a long whole day to explore the city. Palma de Mallorca came next, then Barcelona, both I had too many visits and so it was relaxing for me. The ship is my destination, that’s why I booked Yacht Club. Often a little stroll on familiar streets, then home for a fine dinner. MSC offers good entertainment with production-type shows every night. Then Ajaccio, my first visit although I have called on Bonafacio and Calvi on previous cruises. It was still too much sun and too hot on Sept 20 to have an otherwise most pleasant stroll of this town. For me ports like this of compact size are most desirable for cruise ships. Then Civitavecchia, and I didn’t bother to add one more of many revisits to Rome. Civitavecchia has become a permanent bore to frequent cruisers like me who do not bother to take 3 hours in train travel to Rome. Last call was La Spezia. An excursion port to see Firenze, Pisa, or Cinque Terre. It was bad that as I landed late I miss the few transportation to the latter, which I have visited of course but want to see again one of the most picturesque places of the world. It was an all-port day busy itinerary, great for first time cruisers of the Med. MSC has many ships doing similar itinerary. The spectacular new vessel Seaview was next to us in Genoa for departure same time but I have chosen Fantasia for Ajaccio to have at least one port of touristic interest to me. Paying a good last minute fare for Yacht Club, it was always a good idea if you have time to spare And alas, I still had time, so I embarked Costa Fascinosa the day I disembarked.. Excellent port but to see Cinque Terre you need to go on shore early. But Spezia itself is interesting. Beautiful bars and restaurants, service not so good. MSC Cruise Line is Cheap...and it shows!